The sky at a glance widget has been improved to look nicer and to be more interactive. Moving the mouse over a pass pops up an info widget showing infor about the pass. Clicking on the pass brungs up the pass details dialog. New layout engine that allows any combination of views to be created in a NxM grid. Closes feature request 2821408. Sky at a glance is now more interactive. Show pass summary when mouse hovers over pass and click on pass shows the details. Added satellite tooltips in polar view showing current Az, El and time to LOS. 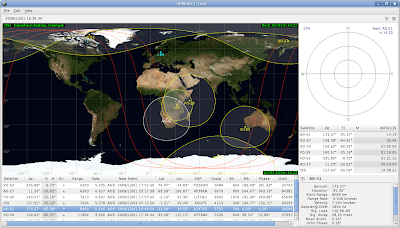 Added satellite tooltips in map view showing current SSP Lat, Lon, Az, El and time to AOS/LOS. Fixed bug 2877974: Incorrect uplink Doppler. Fixed bug 2918672: Trailing whitespace and newline in satellite names. Fixed bug 2914679: Unable to save Future passes. Fixed bug 2674626: Process 100% CPU load with one kepler element. Fixed bug 2792349: Segfault on certain satellites (Geo). Fixed bug 3050068: Unable to update TLE from local files. Fixed bugs 3057771 and 3058753: Crash if module file is empty. Fixed bug 3080019: Corrupted hw file cause crash. Applied patch 2876485: Fix a memory leak in the rotator controller (Thanks to Charles Suprin AA1VS). Applied patch 2877878: Change Flag to Lock in tle-update (thanks to Charles Suprin AA1VS). Applied patch 2877918: Fixes segfault in TLE updater (thanks to Charles Suprin AA1VS). Applied patch 2881367: Updated Flags to Locks (thanks to Charles Suprin AA1VS). Applied patch 2893617: Patches for fixing Windows build (thanks to Valentin Yakovenkov). Applied patch 2916646: Minor fixes to documentation (thanks to Paul Schulz). Applied patch 2929816: Fixes Bound Checking in gtk-rot-knob.c (Thanks to Charles Suprin AA1VS). Applied patch 2930342: Improved robustness of pass prediction (Thanks to Charles Suprin AA1VS). Applied patch 2933879: Check for AOS before burning computational resources (Thanks to Charles Suprin AA1VS). Applied patch 2943018: Potential Double Free in qth-data.c (Thanks to Charles Suprin AA1VS). Applied patch 2942658: Ground Tracks with Narrow Windows (Thanks to Charles Suprin AA1VS). Applied patch 2943024: Eliminate Segfault in gtk-sat-map.c (Thanks to Charles Suprin AA1VS). Applied patch 2943448: Remove Segfault from corrupted module (Thanks to Charles Suprin AA1VS). Applied patch 2945525: Sort list of modules in open module dialog (Thanks to Charles Suprin AA1VS). Applied patch 2947459: Make Module List Scrollable (Thanks to Charles Suprin AA1VS). Applied patch 2951724: Allow TX Doppler correction for FT-817, 857 and 897 (Thanks to Charles Suprin AA1VS). Applied patch 3002344: Remove Uninitialized Jump (Thanks to Charles Suprin AA1VS). Applied patch 3002345: Free catfilename (Thanks to Charles Suprin AA1VS). Applied patch 3002348: Option context never freed (Thanks to Charles Suprin AA1VS). Applied patch 3005548: Cut and Paste Error In print_pass.h (Thanks to Charles Suprin AA1VS). Applied patch 3009725: Delete Explicit Call to gtk_set_locale (Thanks to Charles Suprin AA1VS). Applied patch 3009727: Free satellite hash references (Thanks to Charles Suprin AA1VS). Applied patch 3059022: Fix gpredict crashed with NULL pointer exception (Thanks to Charles Suprin AA1VS). Slightly improved UI for the single-satellite view. Command line options for cleaning user’s TLE and transponder data, see –help for list. Satellite Map: Added shadow to satellite marker and label to enhance visual appearance over light background map regions. Fixed incorrect uplink and downlink frequencies for HO-68, mode V/U packet. Modules that are docked in the main window can be reordered by dragging the tabs. The new release can be downloaded from https://sourceforge.net/projects/gpredict/files//Gpredict/1.2/ – Currently only the source package is available. Binary packages for Windows, Mac and various Linux distributions should become available shortly. Thanks to everyone who has contributed to this release!